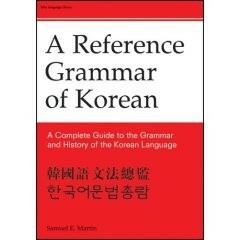 Produktinformationen "A Reference Grammar of Korean"
By one of the leading scholars of East Asian languages, this is the first comprehensive book on Korean grammar in English. With a detailed analysis of modern Korean as it�s used in both North and South Korea, Professor Martin provides explanations and translation tips for virtually all puzzling grammatical structures. In addition, modern usage is traced back to the fifteenth century, making this book essential to anyone reading older Korean texts. Including character tables and an appendix of the radicals and their names A Reference Grammar of Korean will prove indispensable to students and is the definitive reference work for all those involved in Korean studies. Samuel E. Martin received his undergraduate and master�s degrees in Oriental Languages from the University of California at Berkeley and his PhD in linguistics from Yale University. He is the author of A Reference Grammar of Japanese. Weiterführende Links zu "A Reference Grammar of Korean"
Unser Kommentar zu "A Reference Grammar of Korean"
Kundenbewertungen für "A Reference Grammar of Korean"